One of the things I first noted when I interviewed for my current job is that the library is a small space. We have about 1000 sq. feet of usable space in the library on the main floor, another 1100 sq. feet down in the Youth Department. Obviously, when you have stacks, computers, sitting area, circulation desk...thing get tight pretty quickly. The library itself is quite old and sits in a historic district. Of course, age has its charm AND its issues, but I am sure most librarian will agree that you want to make the best of what you have. For me, that meant making the collection more browseable for patrons, have books go together cohesively, and create some more display space. While I have been using the rolling cart as temporary display area, of course I wanted something more permanent. We have been doing a massive weeding project on the main floor, starting with non-fiction. I have been ruthless, I admit it. However the statistics on the books showed that more took up shelf space than circulated, so out they go. There are definite holes in the collection that will need to be filled, and sections like computers and travel need to be updated. Quickbooks 99, anyone? With this weeding we ended up opening up a couple bays in non-fiction, which got me thinking. Originally, our biography section was clear on the other side of the library, and faced the young adult collection, which filled up shelving facing the main sitting area. I decided to move biography back to the end of non-fiction, and shift young adult around to give that collection its own space. and biographies have been moved to non-fiction. We moved the tilting bookcase behind the circulation desk, to replace a small-yet-awkwardly-placed table that we kept whacking our hips on. Then it was time to shift the New Titles. Our patrons love browsing the New Titles, so we can combine it with displays throughout the year, satisfying everyone. There are more collection changes to come in the library as we finish weeding and shifting some other areas. I hope that our patrons will find it easier to browse! Alternate reality fantasy is a fun read for me, as it can be a terrific look at history through a different lens. 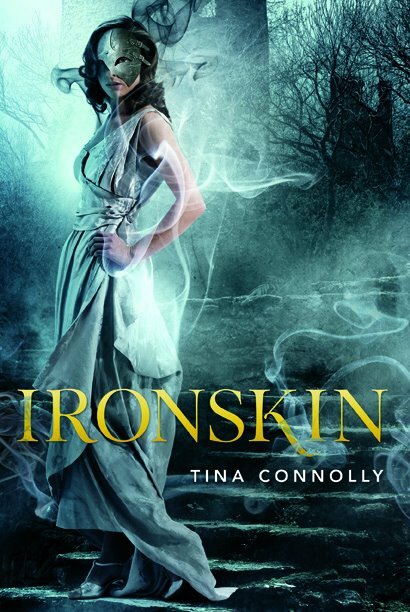 In Ironskin, a Great War between humans and fey has dealt damage to England; the country still struggles in its aftermath of lost technology, and war victims try to live their lives with the damage that the fey bombs inflicted. Jane Eliot has dealt with the fey curse that mars her cheek by doning an iron mask, protecting others from its twisted power. Taking a job as governess to one that is also afflicted, Jane works to help both young Dorie control her powers, as she has worked to control the rage that can course through her -- and others -- without her iron shield. Dorie also works to stifle the feelings she has for Dorie's father, Edward Rochart. It isn't difficult at first, as both Jane's shame at her scars, and concern about Rochart's work, make it difficult to trust him. Rochart's studio is closed to most, but as ugly women walk in, beautiful women walk out. Women as beautiful as fey. Questions abound, not just about Dorie's power or Rochart's studio, but in the truth of how far Jane will go to find true love - and true beauty - again. Ironskin has been touted as a "Jane Eyre retelling", and I will have to presume that comparison as favorable as I have never actually read Jane Eyre myself - bad librarian! Even without that, I felt drawn into this Victorian fantasy where fey and human used to work together and where technology existed before the Great War and humans must rely (once again) on coal and steam to power things. Jane's character developed through the entire book, and while sometimes she was frustrating (as heroines in love are wont to be) there was a thread of strength and caring, not only in her relationship with Dorie, but with her sister Helen as well. I will say that the story took turns I was not expecting, and I am intrigued to discover what will happen in the next book. Sarah Beauhall is a blacksmith, but since that kind of work doesn't really make ends meet, she also works nights as a props manager for her friend's low-budget fantasy film. When the lead breaks her favorite sword on set, Sarah agrees to reforge it so the shoot won't stretch on longer. One of the dwarf extras offers his help, but it seems he has a lot of incredible news for her, like the fact he is an actual dwarf. And her blade is magic. And she is supposed to kill a dragon. Before Sarah can say shape-shifter, things really start to get weird, and fantasy becomes fact as Sarah must go from behind the scenes to playing a very real role of heroine charged with saving the world. 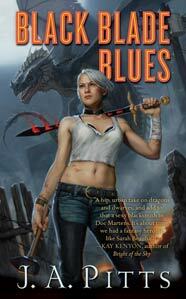 I was impressed with Black Blade Blues on a couple different levels. Pitts brings Norse elements into the storyline very cohesively. Sarah is a very fleshed-out character from the beginning, strong and sure in her work, but a bit hot-headed and struggling with her feelings. Being told that the fate of the world is in your hands would be difficult for anyone to handle. As a young woman who is a SCA (Society for Creative Anachronism) member and who creates weapons for sale at fairs and cons, it would seem logical for Sarah to be a believer off the bat. But she doesn't buy in -- and that resistance mirrors the other thread of her story that goes through the book. Sarah is a not-out-of-the-closet lesbian in a relationship with Katie, who is quite comfortable with her orientation. Sarah's outward life -- her work, her relationship -- is diametrically opposed to the her childhood belief system. Obviously this creates tension and clashes between Katie and Sarah. So, not only do we get to see Sarah work to believe in her role in the world's salvation, to believe that dwarves and dragons exist, but we also see her struggle with caring for another woman and the feelings she has to process to believe in her relationship with Katie. Ultimately this is a story about being the heroine who is charged with "slaying the dragon." Sarah has more than just the live one threatening her world to deal with, however, she also has the one created from her fears. Pitts does a good job balancing this urban fantasy with Sarah's struggle to find her sexual identity, and neither storyline overshadows the other's importance. The book is the first of a series, and I have the sequel, Honeyed Words, sitting on my TBR Pile. Probably not for long. It's been another busy couple weeks at the library! Summer Reading is underway, with both an Adult and Youth Program available. I have never overseen summer reading before, and taking on the adult program was challenging and fun at the same time. I definitely believe in not "recreating the wheel". There has been an Adult Summer Reading Program at my library for a few years, and I did not want to change it entirely - but I did want to make some changes to the events, which was introducing crafts. I admit it - I like to make things. I am a knitter, always loved art projects when I was younger, and I completely support the notion of "Why should kids have all the fun?" Of course, I didn't want to overlap with the Youth Department, so I went to the internet for inspiration, mainly Pinterest. If you haven't used Pinterest for inspiration in any part of your life, go take a look. I have my own set of boards, but know that libraries are starting to use them for collection highlights. Our library system, MLS, has a set of pin for the MA 2012 Summer Library Program, which is where I found my idea for Glow Jars. 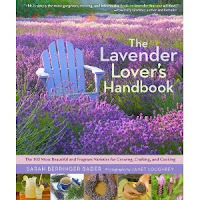 The Collaborative Summer Reading Program, which MA is part of, had resources for adult programs and I was inspired to try out lavender sachets. We had the Glow Jar craft a couple weeks ago. Supplies were simple: clean glass jars of different sizes (having a dishwasher at home, along with Goo Gone, made this easy), glow in the dark paint (from the local big box store) and paint brushes. The jars were a combination of ones already being saved down in the Youth Department and ones I had collected at home. My sign - with a couple of samples I made. One I splattered the paint inside with the paintbrush, the other I painted in patches. We had about a dozen patrons drop-in for this event, which being the first adult craft, I count as a success! This afternoon is the lavender sachet craft, so I will let you know about that next week. Griffin Shaw was a P.I. back in the day -- fifty years ago. Now, he's an angel who has been helping souls cross over to the Everlast. Griffin is forced back into a mortal body to bring the soul of one Katherine Craig over, due to his interference with her friend Nic Rockwell. Yet Griffin has skirted the rules long enough to know that the gorgeous journalist may just be able to figure out the one case he never solved: who killed him and his wife? Protecting Kit may be more than this gumshoe can handle, especially with his growing attraction to her and the forces working to stop them. 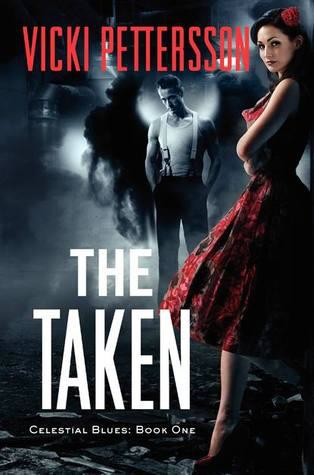 Those who are thinking "oh, another fallen angel story" should think again: this book has all the elements of a hard-boiled mystery, layered with urban fantasy. The Taken introduces Griffin Shaw, a "Centurion" angel who assists souls that died violent deaths into the Everlast -- or wherever else they may be going. Fifty years ago Shaw met his own untimely demise in Las Vegas and has been trying to figure out who killed him, along with his wife, Evie, while safely - if not always kindly - guiding souls to their own everafter. This time his actions with journalist Nicole Rockwell change Fate, which earns him a ride back into mortality and back to Sin City, along with the task of bringing Katherine Craig's soul over before he can have his wings back. Kit is a rockabilly gal working at her family newspaper and never expected that her best friend would be killed while investigating a prostitution ring. With her sleuthing sights set on finding her friend's killer, Kit and Griffin team up, discover a conspiracy far larger than they expected, and find themselves targeted by souls both mortal and not. There is just something about this book: its genre-bending premise should please both mystery and fantasy enthusiasts. The added details of Kit's rockabilly lifestyle bring an interesting twist to the developing personalities, especially because Griffin was actually alive and in his prime during that time. Both characters are smart, and a little damaged, and all the more believable with their stubborn focus on the cases at hand. While some of the angel-born vs. bred trope is a little over the top, Pettersson envisions a Heaven that seems as complicated as life on Earth. I was drawn into the plots, both the immediate one and those hinted to come. As I noted in my last Pettersson review, I was not as pleased with the ending of her last series as I could have been; those who wanted a smoothly wrapped-up ending didn't get it with Joanna and her story. It was raw and real and made me shake my head and wonder "Is this it?" Pettersson is just the kind of writer that will leave strings dangling, but that tendency will certainly keep me waiting for the next in this series. Sadly, part of moving back to western Massachusetts meant giving up my garden beds I had created and used the last couple of years. I am still renting, but now in a duplex and I have not been able to address any sort of planting over the last months, except to place my various houseplants out on the shared porch. However, I am very lucky to have a girlfriend who owns her own place, and graciously gave up side yard space to veggies! I admit I had been eyeing the space as it gets great sun through the day. We both agreed that raised beds would be best, and since we weren't sure where we wanted to start, we would start small. Really. This time I meant it. Look, it takes a lot of dirt, people. Yards and yards of it. I swear. This is not even all of it. We decided to cut out the sod, which was moved to other areas in yard that were grass-deficient. We also stacked two kits together, to give us a raised bed that was 4 ft. x 4 ft. by about 14 inches deep. These kits were easy to put together, and stacked like Lincoln Logs. All complete with soil, manure and compost that was already accessible. Then it was time to decide what we would actually use to plant this season. We finally decided on tomatoes, basil, and jalapenos. We like to make salsa and use basil and tomatoes on a regular basis, so it was a pretty easy decision. In they went! We went with standard Genovese Basil, jalapenos and four kinds of tomatoes. We did San Marazano Paste and Brandywine for full-size and Supersweet 100s and Black Cherry tomatoes. Needless to say, with the sun and heat they have been thriving! I am so, so happy. While the initial cost for the soil was a large investment, the rate of growth has been worth it. We have had to do little for pest control, only one application of neem oil about two weeks after they went in. The surface leaves are still a bit chewed, but no major outbreaks. This is how they look as of yesterday. I have not had plants that have done so well in my previous years of gardening. We are already making plans for next year, like knowing the tomatoes will need their own bed. There is only four of them, but we still crowded them a bit. The San Marazanos are adorable with their shape. These are supposed to be great paste tomatoes, and will add them to our canning endeavors the next few weeks. The cherry tomatoes are coming along well too! I am not as much of a tomato snacker, but we definitely have kids that are. Jalapenos ahoy! These actually mature to red, but we are thinking of pulling some now to try out. Guacamole anyone? So, I have now been in my new town and new job for almost three months. When I decided to take the job as a library director, I knew that I could be setting myself up for a lot of things I was not expecting. I have a diverse enough background - my librarian path has covered cataloging, acquisitions, reference, circ desk, technology, digitization, ereaders and ebooks, my other experience in finance, bookkeeping, municipal work, and book retail helps for sure. There has been a lot of administration - budget, meetings, scheduling, mail, invoices, vendors - tasks I have not had to deal with a lot before, but are now mine on a daily basis. Some days I feel like I do not get up from my desk, but I have been able to work the desks (upstairs on the main adult level and downstairs in the Youth Department) and start seeing some of the regular faces that come in. However, there have been some interesting and unique things I have worked on also. While I admit I am a wannabe beekeeper, this is not the route I was planning on going with it. The library has had carpenter bees up in the eaves for the last few years, so when my custodian said he would spray before the library opened, I came to help. Of course, I had to suit up to protect myself! I also replaced the flush valve on the running staff toilet my first week in. No, I didn't take pictures of that. My library has very limited display space, but I really wanted to find a place to highlight titles each month, beyond the New Titles Bookshelf. So, I moved a printer cartridge recycling bin, found a rolling cart that wasn't being used, and bingo - instant (and portable) display space. We highlighted gardening titles to start, but also had a display for Ray Bradbury, and now it holds titles for the Adult Summer Reading Program. I have ideas - big picture, pie-in-the-sky ideas - but I have tried to spend the last weeks getting to know my staff, the patrons, and make sure we all feel we are on stable ground before moving forward. These people have been here longer than me, and they know the library inside and out. I need to learn from them as much as they will look to me for support and guidance. ...because Books, Yarn, Ink and Other Pursuits finally has its own domain! Thanks to everyone for sticking with me! A new post is coming on Monday. Do you know where the "alula" is on your chicken? Do you have an Andalusian or an Aracuna? Are you trying to figure out if you chicken has "omphalitis"? Do you even know what any of these words mean? With The Chicken Encyclopedia, you will have the definitions to all of these and more at your fingertips. 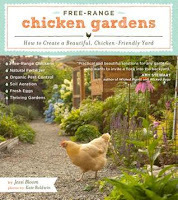 Gail Damerow is a well-known name when it comes to chickens, having written the Storey's Guide to Raising Chickens and The Chicken Health Handbook. 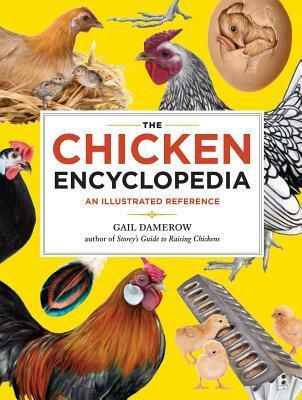 In The Chicken Encyclopedia, Damerow gathers an A to Z guide for chicken owners and enthusiasts. At over 300 pages, this book is a comprehensive reference to terms used for breeds, anatomy, disease and more. Special highlights on some topics, such as "beak trimming", "droppings" and "self-sufficient breeds", plus color illustrations provide an expansive overview to everything chicken. 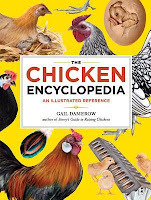 While maybe not a book that you will spend leisurely reading cover to cover, The Chicken Encyclopedia is a must for those owning chickens. There is always something to learn, and Gail Damerow has provided a bright, accessible and informative reference. With the prevalence of backyard chicken owners, farmers markets and local farms, having access to fresh eggs is much easier than it has been. In fact, if you own chickens, sometimes you wonder what you can do with all of them. Fear no more, as The Fresh Egg Cookbook will take you "From Chicken to Kitchen" and give you a wealth of recipes to choose from. 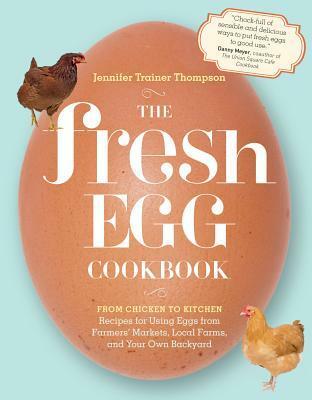 The Fresh Egg Cookbook comes at a time when more and more people are becoming chicken owners and finding themselves with a surplus of eggs. In her introduction, Jennifer Trainer Thompson details her journey to becoming a chicken owner in Western Massachusetts. Before launching into recipes, Thompson discusses good breeds for eggs and other questions about eggs that others may have. The chapters outline the "Classics" of egg use in condiments like mayonnaise and Bearnaise sauce, then onto the meals. The ranges of soft- to hard-boiled eggs to the Tex-Mex migas, fried egg sandwiches to a wild mushroom ragout with poached eggs will please many. Thompson also gives ideas for what to do with those big excesses, with recipes for deviled eggs and pickled eggs. Chapters on vegetarian dishes and desserts round out the recipes. 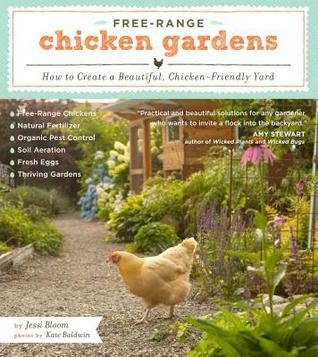 Interspersed in the chapters are vignettes about her own experiences with raising chickens. Colorful photographs of both family and food provide a great backdrop to the text. The Fresh Egg Cookbook is a welcome addition to specialized cooking manuals. By no means exhaustive, a nice range of recipes is included. While most of the text is devoted to the meals that can be made, the personal stories are fun and make a great addition to an already lovely cookbook. If you long for the days that will get you back outside in the sun, digging in the garden, looking at chicken coop plans, then it is likely that you have heard of Jenna Woginrich. 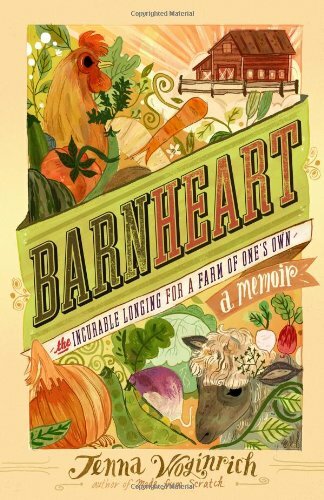 Author of the popular Made From Scratch and Chick Days, her latest book is Barnheart, which I reviewed on the blog yesterday. I was looking forward to this one so much I leaped at grabbing a copy from the store as soon as I could last month. Little did I know that Storey Publishing would be sending me a review copy also. This means I have a copy available for my readers! This giveaway will be a little different than the others. Just leave a comment below about your Barnheart (if you have it!). How do you express it? What are you still hoping to do? I have my garden space in back, and try to can and preserve through the seasons. I have spearheaded a campaign to allow chicken hens in our fair city, and right now it is in committee. One day, I hope to have the land and space for more, but until then I will fulfill my Barnheart the ways that I can. The Rules: Giveaway ends at 9 PM Monday, Feb 6. Winner will be announced on the blog Tuesday morning. One comment per person; please make sure that you include your email one way or another on the comment so I can contact you! The book will be mailed directly from me, so I will get your information that day. While many people are content to dabble in gardening, maybe raise a few chickens, there are some that find it just scratches the farm itch. Being able to act on those desires can take a great leap of faith. Jenna Woginrich made that leap, from Idaho to Vermont to New York. For all of those who feel the same way, the author admits this is an illness that can only be cured by sun, dirt and the sounds of the barn. This, my friends, is Barnheart. I first heard of Jenna Woginrich with her first book, Made From Scratch, and have been reading her blog, Cold Antler Farm, since then. Farming has become chic to a lot of people; urban homesteading is growing by leaps and bounds, as you can see from any bookstore or libraries' shelves. However, there are many who are not doing it to just be part of the culture that it has become, but because their lives need it. 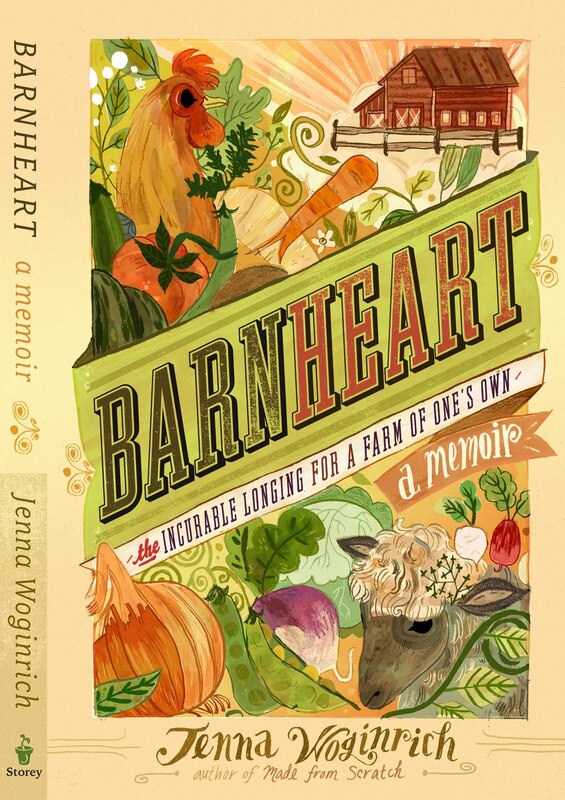 Barnheart chronicles Woginrich's journey back to the East Coast and her time in Vermont, plus her acquisition of the homestead she has now in upstate New York. Farming is not an easy life, and Woginrich does not back away from the lean times, the solitude, the mistakes, the fear that came with her decisions. Failure is always a possibility; failure happens. (Anyone who has followed Neysa's journey on Homegrown.org will know it does.) Beyond this, there is success also, and Woginrich shares the joy of walking the path to achieving her dream, her life goals, one step at a time. What I really enjoyed was the changes in writing from her first book to this one. There is an amount of self-revelation that Woginrich has given her readers which was not evident in the first book. While this would definitely not be considered a Photoshopped version of farming, there is a depth of self-awareness and analysis in Barnheart that I do not remember from Made From Scratch. What Barnheart emphasizes is the perseverance, even knowing the failures and downsides. Because as Woginrich points out time and time again, Barnheart is not about a pastime - it is a way of life.